It’s been called the most miserable transit hub in the Western Hemisphere—“decrepit,” “soul-crushing,” and many other pungent epithets. It’s certainly the busiest. Hundreds of thousands of people hustle through Penn Station’s labyrinthine, low-ceilinged corridors every day. Amtrak owns the terminal but shares space and operations with New Jersey Transit, Long Island Rail Road, and the New York City subway. Problems have compounded in a system stretched beyond capacity. Minor delays become major headaches, and overcrowding erodes safety and security. The whole enterprise—and much of the economic vitality of the region—relies on crumbling, outdated infrastructure: narrow platforms, failing ties and switches, and tunnels that may be one major storm surge away from becoming permanently inoperable. On top of it all, literally on top of it all, sits Madison Square Garden. 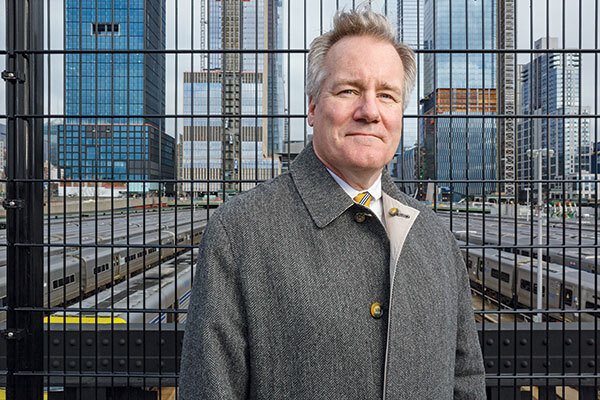 For Samuel Turvey, FCRH ’79, LAW ’83, the way forward for Penn Station is through its storied past, a time when the station wasn’t a sunless maze but a shining symbol of New York grandeur. 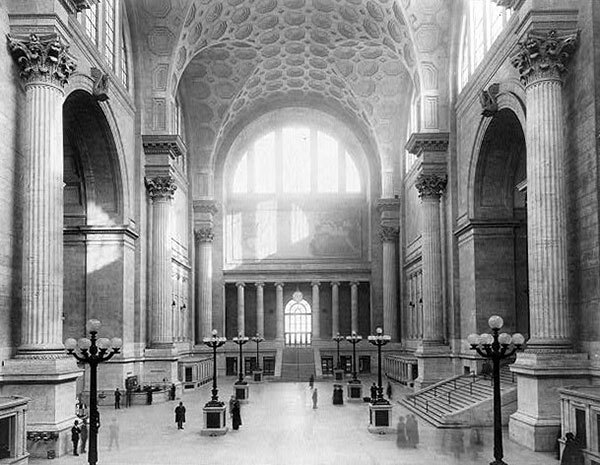 Turvey leads the steering committee for Rebuild Penn Station, a project of the National Civic Art Society conceived by architect and historian Richard W. Cameron. They have been calling for a new and improved version of the original station, as well as a comprehensive transit plan to ease regional congestion. By the early 1960s, however, the Pennsylvania Railroad had fallen on hard times with the advent of the interstate highway system. 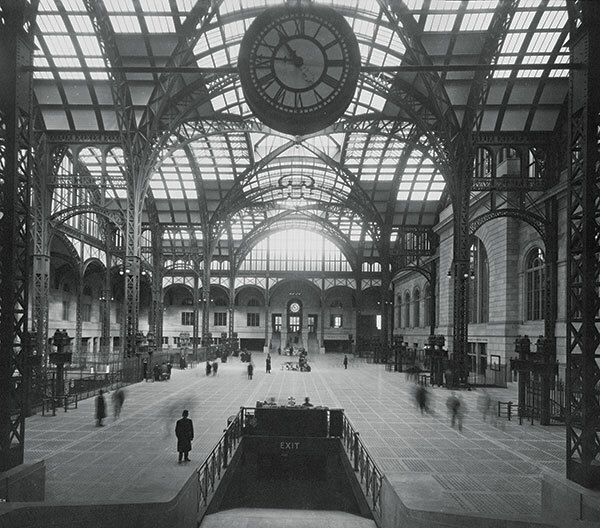 “Ultimately, their duty was to shareholders, not to posterity,” Turvey says of the railroad’s decision to skimp on upkeep and sell the air rights to developers who eventually demolished the original building and built the Penn Plaza offices, a theater, and Madison Square Garden atop the station’s platforms and tracks. Turvey believes New Yorkers deserve better, and so does Gov. Andrew Cuomo, FCRH ’79. Last January, during his State of the State address, he reaffirmed his commitment to fixing the station, and left open the possibility of using eminent domain to do it. Some changes are already underway. The James A. Farley Building, the former post office building across Eighth Avenue from Madison Square Garden, is being transformed into a train hall for Amtrak and Long Island Railroad passengers (a project initially led by current MTA President Patrick Foye, FCRH ’78, LAW ’81, who was then working for Governor Elliott Spitzer). 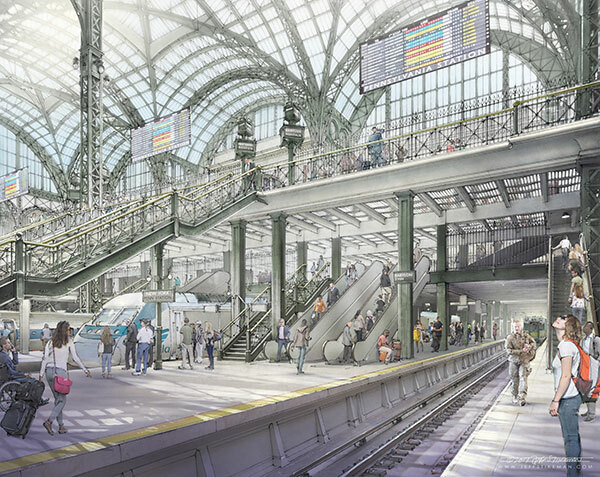 Funded by developers, New York, New Jersey, and the federal government, the renovations are scheduled to be done by late 2020. For Turvey, that’s a good but partial step, one that will alleviate only about 20 percent of the pedestrian traffic at Penn Station and do little to resolve the bigger issues, congestion chief among them. The plan calls for adding or expanding transit hubs in New Jersey, Queens, and the Bronx, while eliminating some platforms in Penn Station and widening others to accommodate more escalators, Turvey says. The plan takes into account the $30 billion Gateway Tunnel Project, which would add a second tunnel under the Hudson. For Turvey and a growing number of civic groups, however, relocating Madison Square Garden is key to renovating Penn Station. They recommend moving it to the Morgan Post Office and Annex, a five-minute walk west of its current location, by the time the Garden’s lease expires in 2023. Turvey knows the old Penn Station from books, photos, and Hollywood films. On a recent stroll through the current station, he pointed out some glimpses of its past: a cast-iron partition here, a brass and iron railing there, some glass-block tiles that were designed to allow natural light to reach lower levels but now bear fixtures for fluorescent bulbs. “Dreams die hard for me,” he admits. But he denies that he’s guided solely by nostalgia, and insists that classical tastes and innovation can go together, citing Grand Central Terminal and Washington, D.C.’s Union Station as examples. The estimated cost, he says, would be between $3 billion and $3.5 billion. Turvey grew up on the north shore of Staten Island, where his grandfather worked briefly as a stevedore for the B&O Railroad. He moved to suburban New Jersey with his family when he was 10 and later enrolled at Fordham, where he developed an interest in urban studies as an undergraduate during the 1970s. “It was an interdisciplinary major, and it gave me the opportunity to take courses with some real prominent Jesuits,” he says, including sociologist Joseph Fitzpatrick, S.J., who later presided at the ceremony when Turvey married his Fordham classmate Patricia Evans, FCRH ’79, and who baptized two of the couple’s three children. In 1983, Turvey earned a J.D. at Fordham Law School, where he was associate editor of the Fordham Urban Law Journal. And throughout his career in legal and financial services, he has been involved in what he calls “public-spirited” pro bono efforts. In the early 1990s, he established the Charlie Parker Jazz Festival, a series of free outdoor concerts in East Village and Harlem parks. He serves on the board of the National Jazz Museum in Harlem, and he’s a trustee of the Noble Maritime Collection at Snug Harbor on Staten Island. 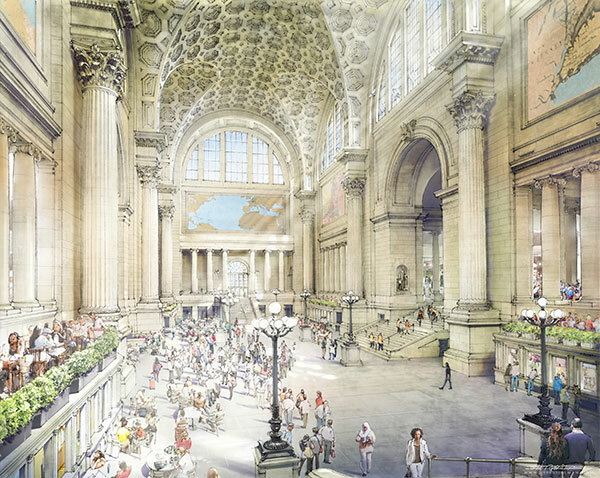 He sees “a transformative resurrection of the original Penn Station” as part of that. And he remains inspired by the democratic spirit of the original station.